Just a quick (and final) note since I have a lot of you who follow the blog via RSS/Email – I released the “Home Brewing with BeerSmith” book last Wednesday! 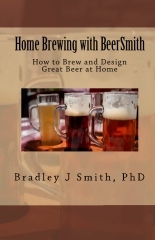 The book is a compilation of over 70 articles from the BeerSmith blog. Thanks to the community, it has been well received so far. Quite a few of you have written me – and I appreciate it. The book is available in printed and Kindle format from the Amazon store here as well as via CreateSpace here. It would make a great Christmas gift as well for your favorite brewer. Als0, I made some major revisions to the BeerSmith blog last week – moving to a new theme to give it a cleaner look. I welcome your feedback if you have thoughts on it. Finally, the new podcast has been well received – in fact the last time I checked we were number three on iTunes for “Home Brewing” podcasts, even though I’ve only released two episodes. Next week, I’ll have an interview with “How to Brew” author John Palmer, and tomorrow will be an article on how to use a refractometer.